Looking to make an immediate impression on the hiring manager? 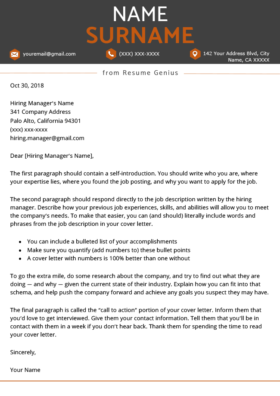 Download one of our unforgettable cover letter templates, and pair your new HR-approved cover letter with its matching resume template. 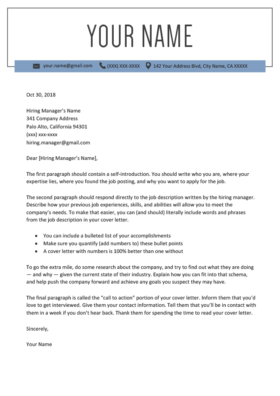 We’ve updated our cover letter template designs to be more modern, eye-catching and colorful. While our classic designs are still every bit as good, if you’d prefer a flashier cover letter, look no further than this pack. While the modern template pack above are great picks for professionals, we felt these designs were especially authoritative looking. If you’re debating which template to use, don’t let our naming schemes confuse you—you’ll land more interviews with each and every single one of our designs. 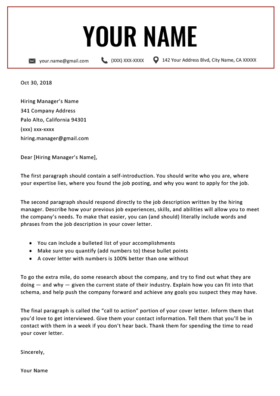 When it comes to cover letters and resumes, the most important thing to accomplish is simply having a clear and well-organized template. 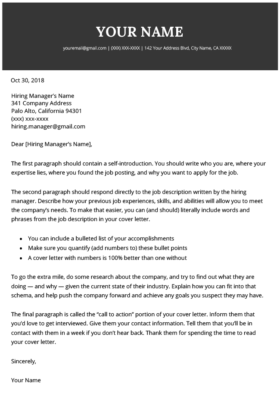 Our basic and simple cover letter designs have been battle-tested by millions of Resume Genius users, so you can have confidence that these will land you interviews. Still in high school but looking to make a little money on the side? Copy and paste the example below into Microsoft Word and update it with your own details, and you’ll instantly have your own compelling cover letter. My name is [Name]. I’m grateful for the chance to apply for the [Position] role at your company. The job description makes it clear that you’re seeking a flexible candidate to manage the many different responsibilities of this role. I am certain that I can meet and exceed all expectations. I am a [Positive Trait] high-school student with a [Your GPA] GPA, and am consistently lauded for being [Positive Trait] by my teachers and managers. During my academic career, I have accrued [Time] of work experience. I worked for [Company Name] as a [Job Title] in my free time, where I learned useful skills such as [1–3 Hard Professional Skills]. Whether engaged on academic, extracurricular, or professional projects, I use proven [1–3 Soft Skills] skills, which I hope to apply in the [Position] role at your company. I hope that after reviewing my resume you will agree that I am the skilled and resourceful candidate you’re looking for. I look forward to describing how my diverse skillsets and capabilities will help your organization thrive. I can be contacted at [Phone No.] or via email at [Email] to organize a meeting. Just graduated from high school and looking for your first real job? Simply copy and paste the example below into Microsoft Word, and tweak it to your exact specifications. That’s really all that’s necessary to assemble a cover letter that inspires interview requests. My name is [Your Name]. I am delighted to be applying for the [Position] role advertised by your company. The job description indicates that you’re looking for an enthusiastic, motivated applicant who will engage with the role and develop professionally. I believe I am the perfect candidate for the job. I am a [Positive Trait] recent high school graduate with a [Your GPA] GPA who has been consistently praised as [Positive Trait] by my teachers and peers. From working on academic and extracurricular projects, I have developed proven [1–3 Soft Skills] skills, which I hope to apply in the [Position] role at your company. I hope that after you read my resume, you will agree that I am the type of positive and driven candidate that you are looking for. I would be delighted to elaborate on how my particular abilities will benefit your organization. Please contact me at [Phone No.] or via email at [Email] so that we can set a convenient time to meet. With college becoming increasingly expensive, many of us take on part-time jobs to pay our way. To make it simple for you to land the perfect position, we have a free college-student specific cover letter. My name is [Your Name]. I am writing to apply for the [Position] role at [Company Name]. Reviewing the job description, I noted that you’re looking for a candidate who is familiar with the responsibilities associated with the role and who can perform them competently. I am certain that I have the necessary skills to outperform your expectations. I am a [Positive Trait] college student [GPA, Major] currently attending [College Name]. During the course of my academic career, I have accrued [Time] of work experience. I had the privilege of working for [Company’s Name] in a [Job Title] role in my free time. There, I had the opportunity to pick up valuable professional skills, such as [1–3 Hard Professional Skills]. In both my academic and professional life, I have garnered praise for being [Positive Trait] by my professors and colleagues. In whatever task I am given, I apply proven [1–3 Soft Skills] skills, which I will apply in the [Position] role at your company. After reviewing my resume, I hope you will agree that I have the skills and experience that you’re seeking. I look forward to describing how my particular skills and abilities will help your organization to thrive. Please contact me at [Phone No.] or via email at [Email] to discuss a suitable meeting time. Thank you for considering my application—I look forward to hearing from you soon. Congratulations, you’re out of college and on the job hunt! It’s time to take the first step on the career ladder. Copy and paste the example below into Microsoft Word, and tweak it to your specifications. Now you have your own personalized cover letter. My name is [Your Name]. I am writing to submit my application for the open [position] role that you’re advertising. Based on the job description, I believe that I have the required skillset and experience for this role. I am a [Positive Trait] recent college graduate [GPA, Major] from [College Name]. In the past, I have won consistent praise for my [Positive Trait] by professors and classmates. During my studies, I developed proven [1–3 Soft Skills] skills, and I hope to have the opportunity to use these skills in the [Position] role at your company. I hope that my resume convinces you that I am a diligent, reliable candidate. I look forward to meeting you so that we can discuss the value I can bring to your organization, and ensure your business achieves its goals. Please contact me at [Phone No.] or via email at [Email] so that we can organize a suitable meeting time. If you’re already in a job and desire a new challenge or are simply unemployed and seeking work, look no further. Copy and paste the example below into Microsoft Word, and change it accordingly. My name is [Your Name]. I’m grateful for the opportunity to apply for the open [position] role at your company. It’s clear from the job description that you wish to hire a versatile candidate who can handle the many facets of the role. Based on my experience, I am certain that I would perform excellently in this role. I am a [Positive Trait] professional [Degree/Specialty] who has been consistently rated as [Positive Trait] by my colleagues. During my career, I have developed proven [1–3 Soft Skills] skills, and I hope to leverage these skills in the [Position] role at your company. I hope that you will agree that I am the skilled, resourceful candidate you’re looking for. I anticipate explaining how my varied skillsets and abilities will benefit your organization. Please contact me at [Phone No.] or via email at [Email] to schedule an appropriate meeting time. Thank you for considering my application, and I look forward to hearing from you soon.